Butterfly decor doesn't have to be childlike or whimsical. 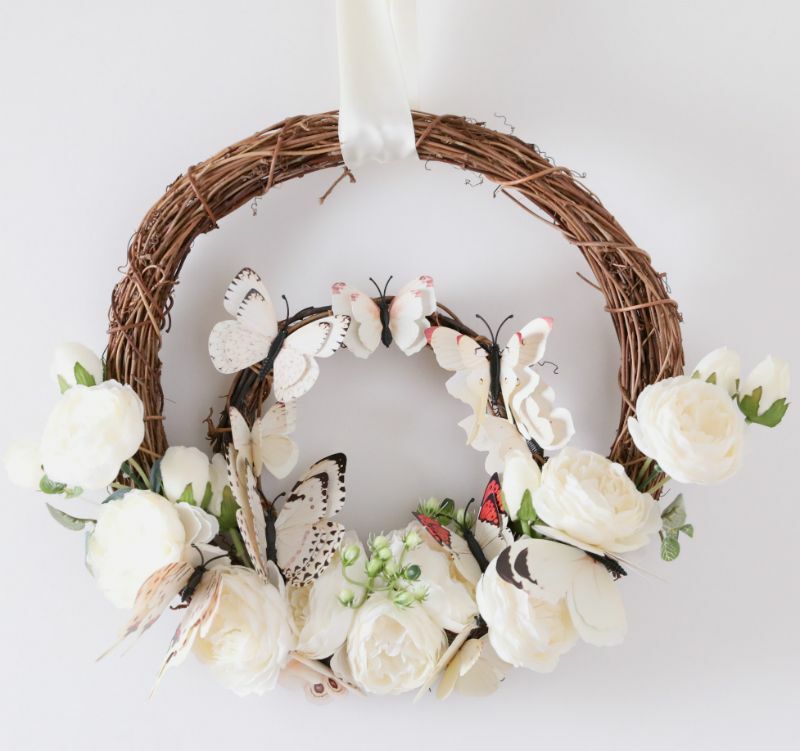 A butterfly wreath in shades of white and black looks sophisticated, creating an elegant touch to any room. Choose one or two butterflies with colors that match a furniture piece, molding or artwork in the room, and add them to the black and white scheme for a burst of color. A wire wreath form also works, but to cover the exposed parts of wire, weave in artificial greenery, baby's breath or small berries. With this wreath, the butterflies blend in a bit more among the additional decoration. 1. Place the 6-inch wreath inside the center of the 12-inch wreath. Slide the smaller wreath down until its bottom touches the inside rim of the larger wreath. 2. 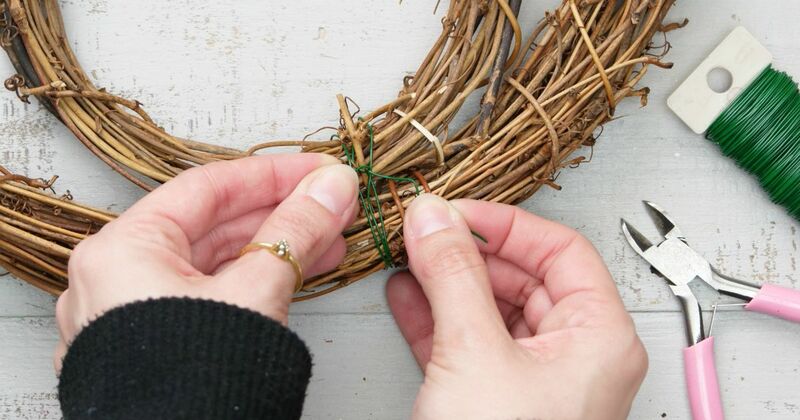 Wrap floral wire a few times through and around the centers of where the wreaths meet to hold them together. Twist the wire so it stays in place. Cut off excess wire and tuck in the points. 3. Cut off nine large blossoms with 1 inch of stem attached. Cut off six buds with 1 inch of stem attached. 4. Slide the stem of one large blossom (B1) under the right side of the wrapped wire's center. Place a dab of glue on the blossom's underside and press it to the wreath, angling the flower to the right. 5. Slide the stem of one large blossom (B2) under the left side of the wrapped wire's center. Place a dab of glue on the blossom's underside and press it to the wreath, angling the flower to the left. 6. Glue three large flowers and a few buds along the right side of the larger wreath, starting to the right of B1. 7. Glue three large flowers and a few buds along the left side of the larger wreath, starting to the left of B2. 8. Glue one large blossom under the center of where B1 and B2 meet. 9. Place a dab of glue on a butterfly's magnet. Gently press it on the small wreath. Repeat this step for as many butterflies as you wish, adhering them around the perimeter of the small wreath, and in among the larger blossoms. Leave bare the top half of the large wreath. Share this exquisite craft on Facebook.